Did you send a card this year? We'd love to know! Just click on the comment section just below the headline. Thanks and look forward to lots more on our blog in the new year...this is short and sweet! Signing off and wishing you a Happy New Year! PS You may notice that this year's card isa recycled version of the card I drew and sent out in 1990...colorized and updated for our family card this year! This Holiday Tradition Will Never Go Out of Style! The photo that started it all for me (top) and my first connection to my family holiday card tradition! Before I launched Social Butterfly Designs in 2000 I worked in Public Relations for Princess Cruises and I would make my own hand-drawn card every year and have it printed by the printer we used at Princess and it was always something my friends looked forward to receiving...at least that was the word on the street, haha. It was an important tradition that I looked forward to creating every year, just like my mom made happen for our family each year from age one to adulthood...(thanks Mom!!). There were some years that this tradition was anything but fun (matching Lanz pajamas with my sisters, dressing up in elf costumes, cookies and milk for Santa and the dreaded "wear your favorite sports gear" years -- see above). It was definitely not always fun...but I am forever grateful for these cards as each and every one holds a special piece of history. I have since kept up the tradition with my only family creating a special memory each year through photos. I made an extra one each year for each of my kids with a stamp on the envelope for added historic reference. One day they will each receive these cards to have as their own slice of holiday tradition. This year’s Laetsch family card is especially fun and memorable but no spoiler alert here...you will just have to wait for the follow up blog post on that....so stay tuned! 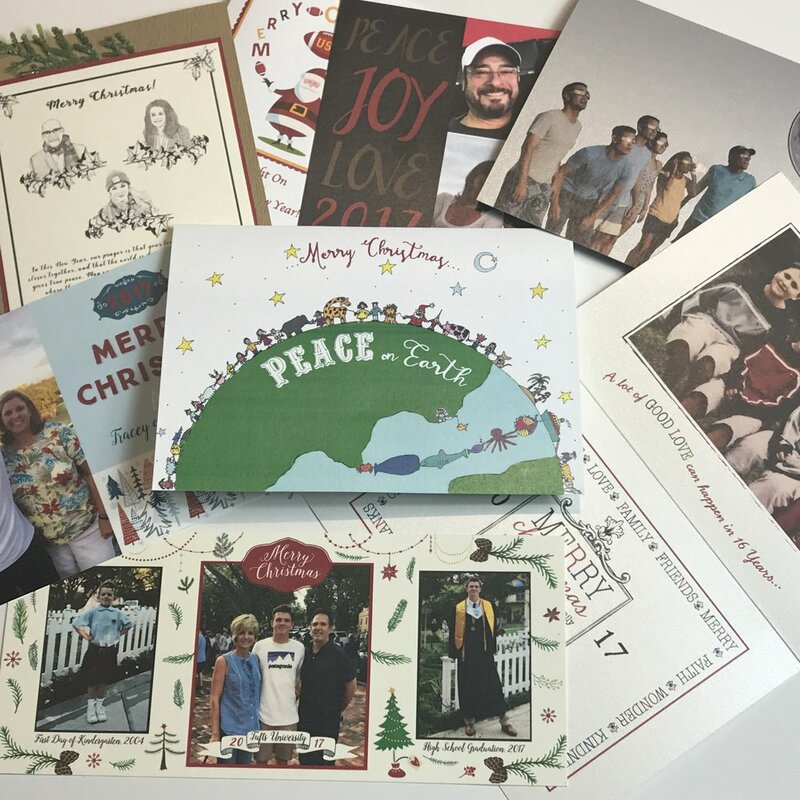 Just this past Sunday there was an article in the Los Angeles Times all about the tradition and importance of holiday cards..."They are done specially. They take time. And they have the power to collapse the distance that separates far away friends and family," according to Liesl Schillinger. You can read more by clicking the link - - this article prompted my blog post for today. I love to work with my clients on their holiday cards. It is so much fun to create something memorable and unique just for them. I take a lot of pride in creating these showcase treasures that connect them with friends and loved ones near and far. In case you were wondering it is not too late for custom orders either, all you need is a photo to start the process. we also have some pre-designed options on our website. If you are interested you can comment here and/or send an email to jill@socialbutterflydesigns.com and let us create some magic for you.